Gone are the days when lip colours like blue,green and black were meant for the runways. This days,a lot of people are coming up with ways to wear these colours outside the runway. No matter how bold and vampy you've been all your life, and even if you have a master degree in bold lippie wearing,there are basic situations where you shouldn't wear a bold lipstick. Preach it to them o Laura. Please what kind of situations oo, so i don't mess myself up cause i like color Red and i wear red lipstick everywhere i go all thanks to mac matie Russian Red. i dont really like bold lipstick , light lipstick will be preferably. Lau lau, dis ur article no complete at all. The sub-heading nd d write-up no follow. Pls do d needful bcos i no understand. 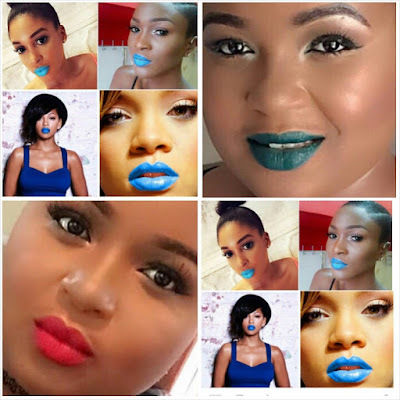 BEAUTIFUL9JADELTABABE.. pple r wearing hold colour lipstick cos dey want to do colour blocking anyway I think bold colours ifs for d clubs babe hmm anyway me am Justsayingmaownohh via ma LATEST TECNO F7. Ok, taken n noted! !,, Kindly follow us for all kinds of human hair, pure brazilian, malaysian, peruvian, Mongolian, BB pin- 2BB4FDAF, Instagram- @hairbyglowyqueen ,, you can whatsap us on 07067499533 or call 08054997426,, We also do FREE delivery to all parts of Nigeria!! !